Last week, NBC cancelled the Timeless TV show, and then on Saturday, reversed the decision and renewed the time travel drama for a second season. And guess what? The fans’ outcry inspired the Peacock Network to come to terms with Sony Pictures Television on Timeless, season two. 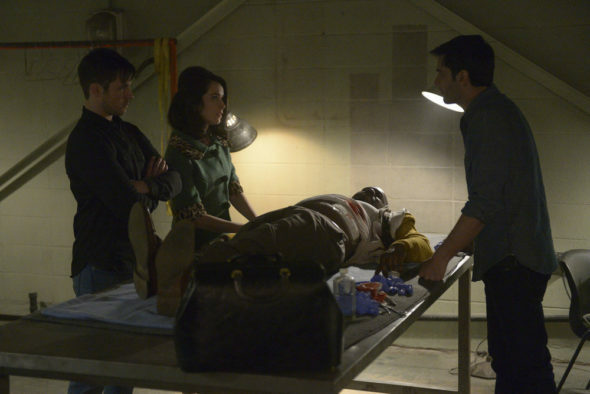 Timeless, which stars Abigail Spencer, Matt Lanter, Malcolm Barrett, and Goran Visnjic, was considered a “borderline” show by NBC, because of its middling broadcast ratings. At first, the network and Sony could not agree, where money was concerned. However, when they saw the huge outcry from fans, in wake of the Timeless cancellation, both parties made it work. Greenblatt and NBC Entertainment president Jennifer Salke were “heartbroken” when they delivered the news to creators Shawn Ryan and Eric Kripke on Wednesday afternoon, as Ryan noted. Here is what happened next as described by Greenblatt on the NBC upfronts call Sunday. By Thursday morning, fans’ reaction to the cancellation of Timeless had reached fever pitch, with them rallying to save the show while Sony TV was trying to find a new home for the series on a cable or streaming network. I hear the core group that worked on making the renewal possible at NBC included Greenblatt, Salke and head of current programming Vernon Sanders. “We love the show, we just said, let’s figure out a way to bring it back,” Salke said. “We proposed something, they accepted and 40 minutes later Shawn and Eric were tweeting about it,” she said. That would be the Saturday 10 AM PT joint announcement by Ryan and Kripke on Twitter. It is unclear whether there was any back-and-forth between NBC and Sony TV over these less-than-72 hours between the cancellation and renewal but I hear that may not have been the case. From what I understand, Timeless will return for a 10-episode second season at the same budget, as exactly the same show and not a low-cost version of it. And NBC executives’ decision may have been driven entirely by listening to what their viewers want and fulfilling their wishes, with no financial strings attached to the renewal. What do you think? Are you happy that NBC decided to renew Timeless for a second season? Do you plan to watch? I love this show and hope that it is renewed for another season! I hope this is true, that Timeless is coming back. I LOVE the series!!! !